The Skylane Optics MDC8UU470A0F – 8+1 Channel CWDM MUX/DEMUX is a high performance MUX/DEMUX module for CWDM dual fibre applications. CWDM is an acronym for Coarse Wavelength Division Multiplexing. The CWDM technology is a safe and proven way of creating a flexible, “pay as you grow” type of high capacity optical network. Once the MUX/DEMUX module is installed you can add extra capacity to your network, without ever having to break the existing traffic. 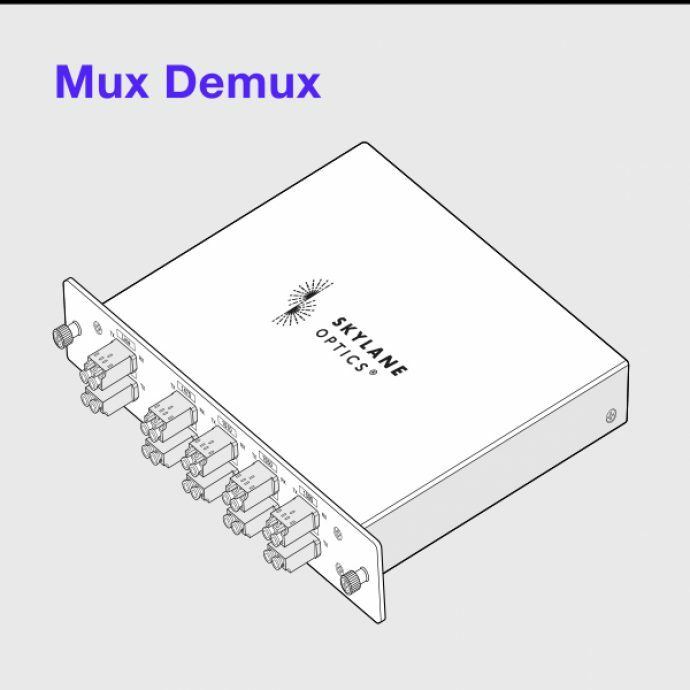 The MUX/DEMUX module consists of a multiplexing unit that combines all eight wavelength into one single mode fibre strand and a de-multiplexing unit that splits the incoming light into eight distinctive data channels. The Extension port enables upgrade to additional CWDM wavelengths in the O and E-bands. The mechanical package is a practical ½ rack size unit that can be used stand alone or in the Skylane 1U 19» rack, L2K09153-01.